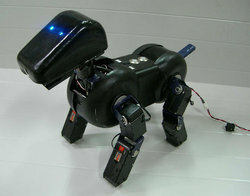 I was sad to see the back of Aibo, Sony's attempt to replace dogs with a robotic variety. But at £1500 a throw, it was never going to catch on (although that's still cheaper than a bulldog puppy). But as one robodog departs the market, another one enters - BJ from IXS Japan.